After facing new life from the America’s Cup defender yesterday, the Challenger Emirates Team New Zealand counter-punched today, winning the two scheduled races of the day, races seven and eight of the final stage of the 35th America’s Cup. 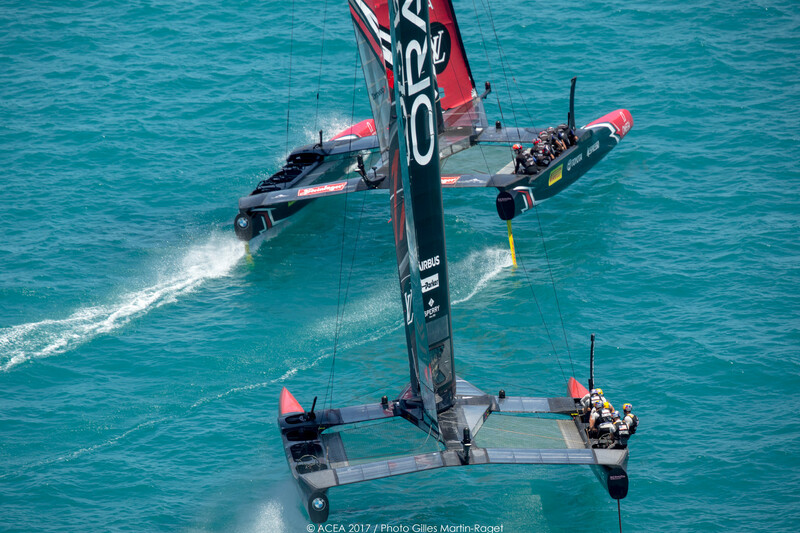 Having split the races yesterday, ORACLE TEAM USA went into the today looking to gain more ground on their Kiwi rivals, but the New Zealand juggernaut had found its pace again and was unbeatable in similar weather conditions today. The America’s Cup Match now stands at 6-1 to Emirates Team New Zealand who need only one more race to take the ‘Auld Mug’ back to their home country. In the 8-10 knots, the Kiwi team was perfect at the starts while their rival made errors, never to see the lead in either race. On a day where the winds were highly variable, the Kiwi team regularly spent their lead to stay in front of the defender, while other times they split to stay in stronger winds. It all worked today. “We were absolutely delighted with how the day went,” said Kiwi helm Peter Burling after claiming back-to-back victories to take his team to the verge of their first America’s Cup success since 2000. “We were disappointed to give away a race yesterday but we certainly made up for it today. “They [Emirates Team New Zealand] sailed better than us today and made a lot fewer mistakes,” conceded defense skipper Jimmy Spithill. “They deserved to win both of the races because we clearly made far too many mistakes out there. We’re in a tough situation now and all we can really do is take this one race at a time. Having made changes to their boat since the opening weekend of the America’s Cup Match, Spithill was asked if there might also be changes to personnel on the ORACLE TEAM USA boat ahead of day five, to which he replied, “Anything is on the table. Every single team member in ORACLE TEAM USA will do whatever they can to help the team win. Racing is scheduled to resume at 2.00pm on Monday June 26 with races nine and ten taking place on Bermuda’s Great Sound. With ORACLE TEAM USA to windward as both teams approached the line, they feared being early and slowed, a mistake that gave Emirates Team New Zealand the open lane to the lead. From there it was a drag race, Emirates Team New Zealand just ahead as they rounded mark one. Spithill blinked first, making the turn before Burling and slowly inching closer to the Kiwis as they headed downwind towards gate two. On leg three there was very little between the two teams but the Kiwis extended their advantage again as they headed upwind, giving themselves a 32 second lead as they headed into leg four. Despite the growing gap, ORACLE TEAM USA did not give up, continuing to try and claw back the advantage the Kiwis were building, but it was largely to no avail. The New Zealanders put on a dominant display, extending their lead downwind to 40 seconds by gate four and then slightly back to 35 seconds upwind to the fifth gate. ORACLE TEAM USA got completely handled on this start, with Emirates Team New Zealand gaining the hook some distance away from the line, allowing the kiwis to bear off and reach to the start, ahead by 13 seconds. By gate two that lead on the downwind leg was already up to 24 seconds and Spithill chose to split the course, a decision that appeared to pay dividends on the upwind leg as the gap started to decrease, but a penalty on leg four as ORACLE TEAM USA sailed outside the boundary effectively ended their hopes in race eight. Again, Emirates Team New Zealand continued to extend their lead downwind, reaching 36 seconds ahead at mark four, sailing their America’s Cup Class (ACC) boat perfectly. This was in contrast to ORACLE TEAM USA whose minor issues kept increasing the difference between the two teams on the racetrack. Race Seven: Emirates Team New Zealand bt ORACLE TEAM USA by 12 seconds. Race Eight: Emirates Team New Zealand bt ORACLE TEAM USA by 30 seconds. * Scoreboard: While the Challenger has won seven of the eight races, their match score is 6-1. The Defender, which won the Qualifiers held on May 26-June 3, began the series with a one point advantage. As the rules detail, the Challenger would carry a one point disadvantage (i.e. minus 1), meaning they will need to win eight races to take the trophy whereas the Defender need only win seven races.